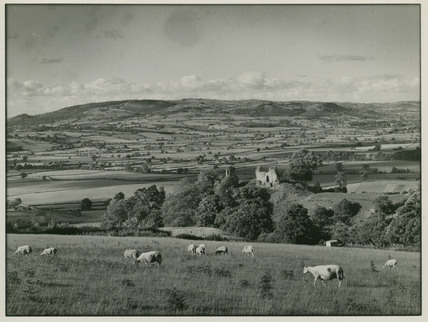 This is an impressive Welsh landscape print taken at Montgomery, Powys, Mid Wales. In the foreground there are newly shorn sheep in a field, grazing. In the middle distance the ruins of Montgomery Castle are visible. In the background there is a significant number of patchwork fields which stretch out until the horizon.